Summary: The long waited Bakemonogatari sequel. Personal comments: This is one of the most anticipated series from this season by many, including me. 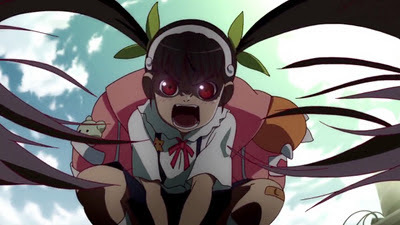 Bakemonogatari is about one of the most unique piece of work I've ever seen. It's strange and mysterious yet funny all at the same time, mostly expressed through dialogs and some simple actions. The director for this anime series is pure genius. It is so unpredictable that you can almost never tell what's about to happen a second later. If you still haven't seen Bakemonogatari, you'd be a little lost, on top of that, you're missing out a lot. Still as good as ever. Love me some Bakemonogatari. Btw have you seen Daily Lives of High School Boys? It's the funniest anime of this season by a long shot. Definitely check it out if you haven't. It's in the queue, I'm chasing them down with airing date.